After it’s painstaking restoration, the addition of manicured terraced gardens and a stunning infinity pool, this former 17th century convent has come to epitomise that understated Amalfi Coast grandeur that we adore. Surpassed only by its privileged location, affording it some of the most spectacular views in the region, Monastero Santa Rosa is a dream getaway. Monastero Santa Rosa truly possesses the best of both worlds when it comes to the ultimate Amalfi location. Perched up on the cliff top above Conca dei Marini, it offers a real sense of exclusivity and privacy. Yet, just ten minutes away, indulge in a slice of ‘La Dolce Vita Amalfitana’ in the entrancing and unavoidably romantic towns of Amalfi and Positano. Then, hop aboard a speedboat and find yourself whisked away to the chic island of Capri. It’s the perfect Italian weekend retreat. But the best way to arrive? Undoubtedly by helicopter, flying over Naples and Mt. Vesuvius and along the glittering coastline. 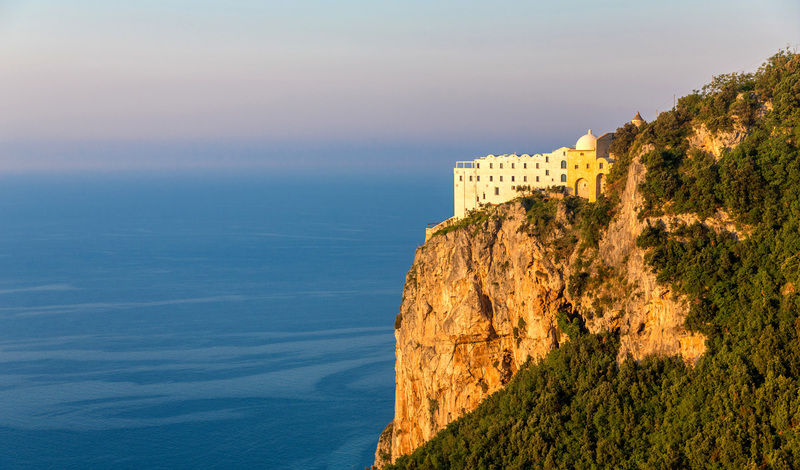 Don’t let the sheer size and stunning Italian grandeur of Monastero Santa Rosa daunt you. Despite its expansive grounds, the property has just twenty rooms. All are spacious and immaculately furnished with every piece of furniture handpicked by the owner during her extensive travels around Italy. Each room is equipped with every modern amenity that we expect from a luxury hotel, all the while honouring the view of endless azure waters. Nowhere affords better views than the Citrus Suite though. Boasting the only private terrace in the property, the views are unbeatable. 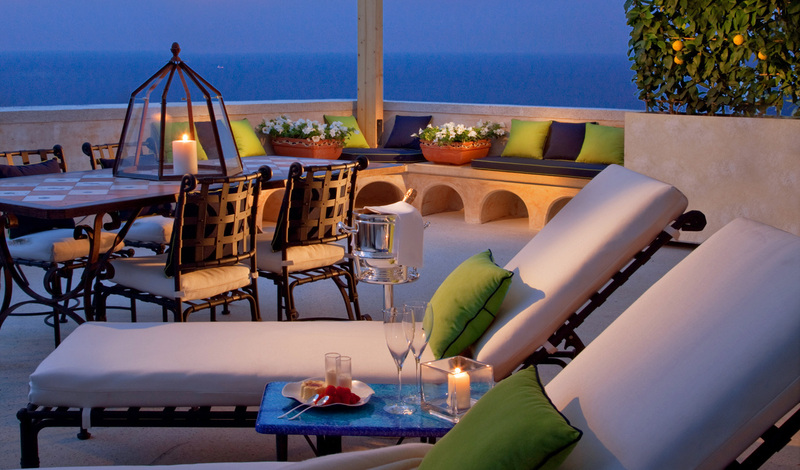 Italy and indulgence go hand in hand and Monastero Santa Rosa does this to perfection. It is the only Amalfitana hotel to offer a true spa experience with a spa to rival any in Italy. Fully equipped, you’ll find a sauna, steamroom, hydro pool, and tepidarium. There’s even a Boccia pitch – and nothing beats a Bellini and Boccia as the sun dips below a sapphire horizon. Except, perhaps, waking up to homemade traditional sfogliatella at breakfast. As you look out over wonderful views, enjoy juicy strawberries, freshly-baked pastries and the best coffee on this glittering coast.